A few weeks in NYC and I feel like I understand how a food business can be successful. Just get on the social media bandwagon and become overhyped. Some places deserve the attention, but others….not so much. When you ask a new yorker where to go for brunch, Clinton St will be on top of that list. The over hype means that queues start forming before 8:30am on the weekend before they open their doors at 9am. We arrived at 8:45am and still had to wait an hour for the second seating. The Fried Chicken and Waffles, which came with maple butter was bland – not well seasoned or flavoured, but very crispy, and the waffles were the best I’ve had in NYC – fluffy and oh-so-satisfying with the maple butter. 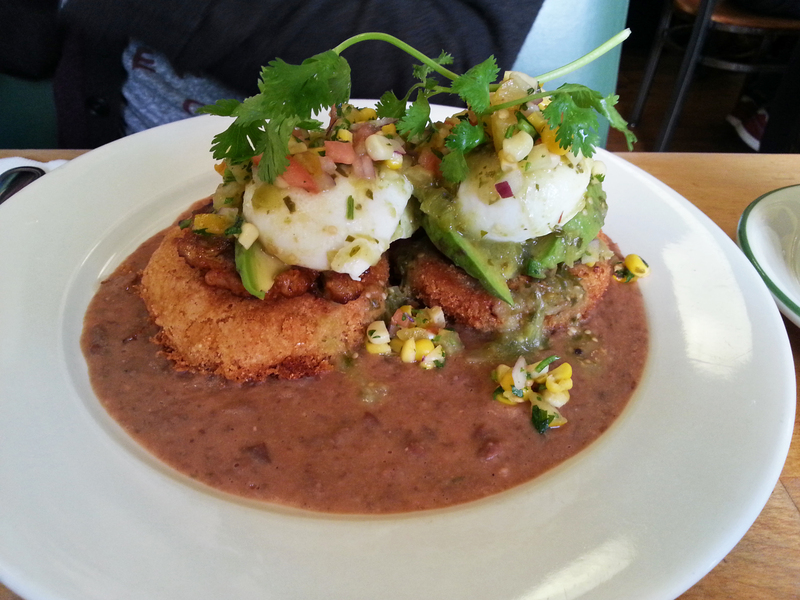 The Huevos Rancheros consisted of simple ingredients but did not combine to be anything spectacular. 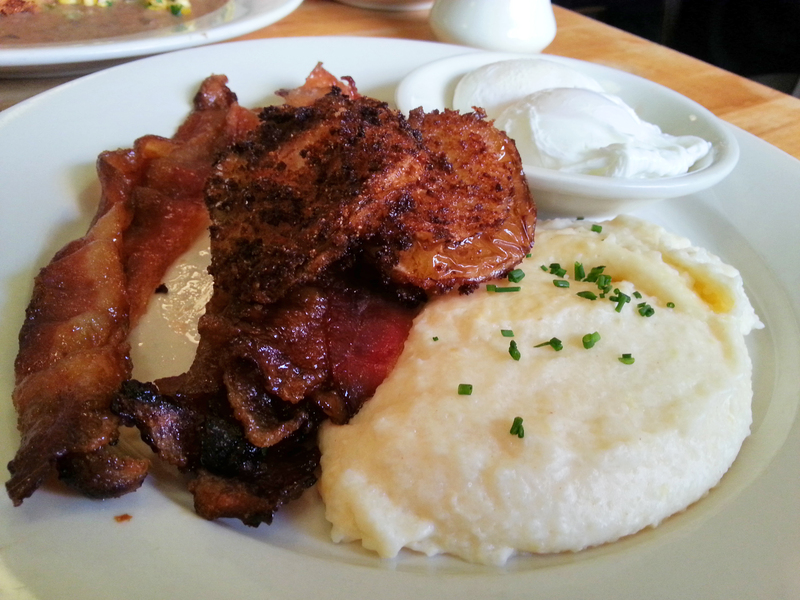 The Southern Breakfast: sugar-cured bacon with cheese grits, fried tomatoes and poached eggs. I never understood the concept of sweet and savoury with bacon before, but now I do. Crispy, sweet, just delicious. Each component of the dish was cooked perfectly but again, it did not come together well. Overall, over hyped but I might need to come back to try their famous pancakes before I finalise my judgement. Busy, even on a Monday evening, this place had to be good! And I was not disappointed. The broth! Thick, flavourful, delicious! 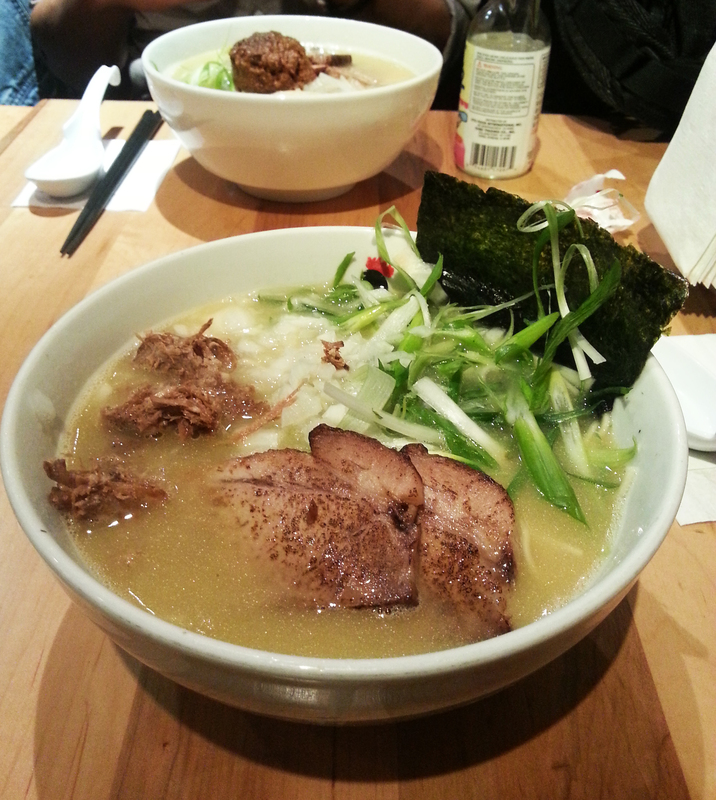 I had the Paitan ramen with pork($9.75), which had a small amount of pork and char siu, which comes with most bowls, topped with LOTS of spring onions and a piece of nori. Surprisingly, the noodles came al dente, which I didn’t particularly like, but is the way the dish is supposed to be. The ramen in the other dishes are served soft. 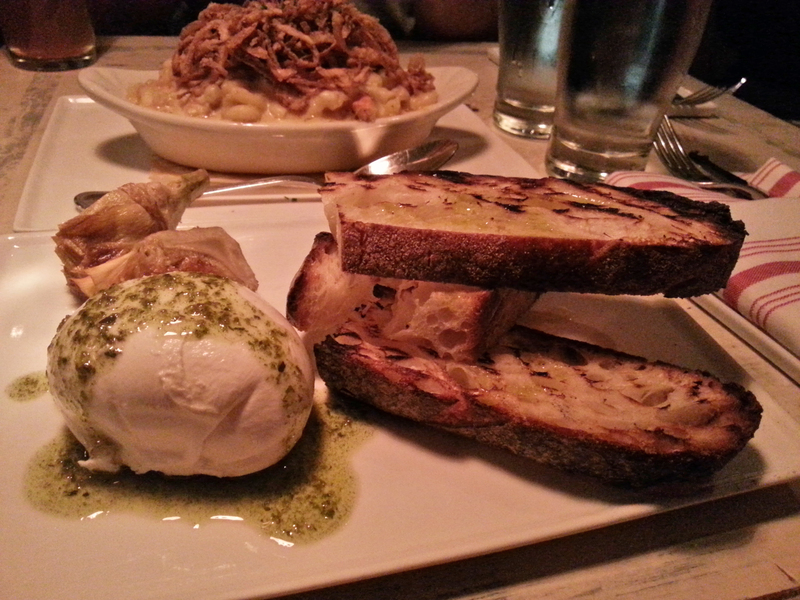 Burrata, with pesto, grilled artichoke and toast ($14). The burrata was served chilled, was firm and incredibly creamy inside. For me, they overdid the olive oil drizzling – I would have liked to have done my own drizzling. But overall, simple ingredients, good dinner. 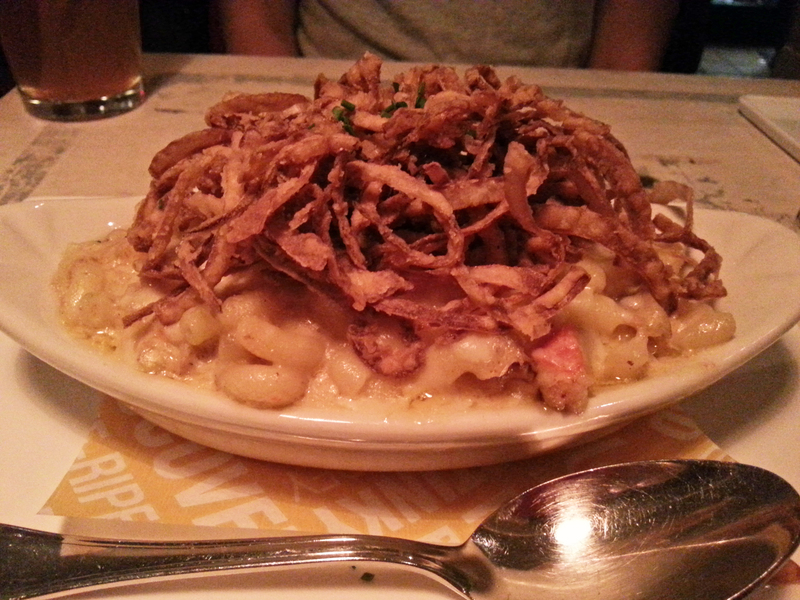 I also had a bite of my friend’s mac and cheese with fried onions. It was delish but simple. Not particularly unique or memorable. 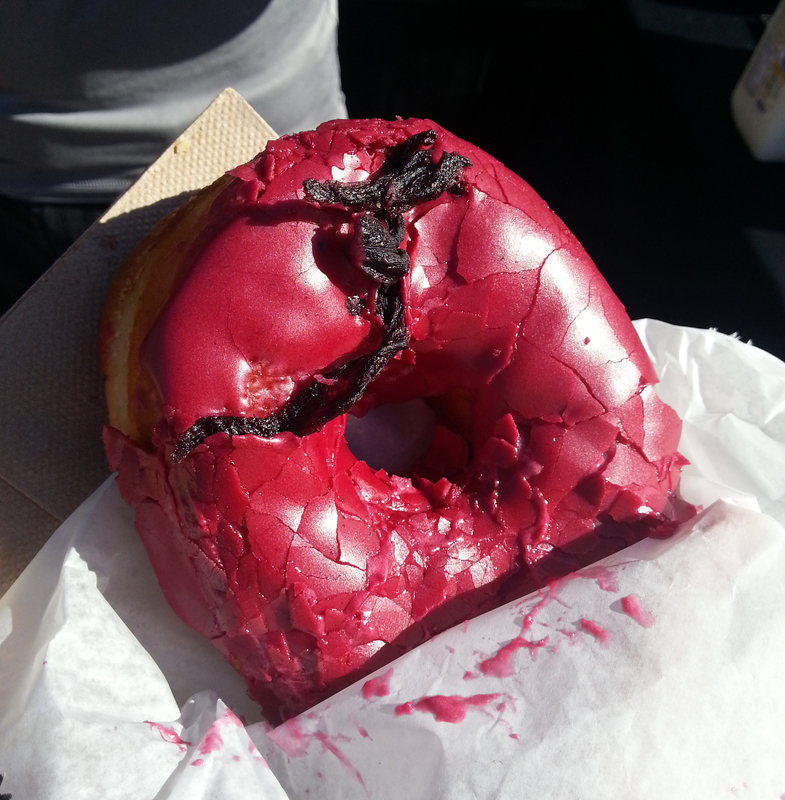 The Hibiscus doughnut ($2.75) from Dough was so soft, the icing had a nice tanginess to it, and the dried hibiscus was interesting – sweet and slightly chewy. However, if the dough was flavoured too, it would have been 5 stars. I have high expectations, I know. There are other intriguing icing flavours on offer including Tropical Chilli, Chocolate Salted Caramel, Toasted Coconut etc. 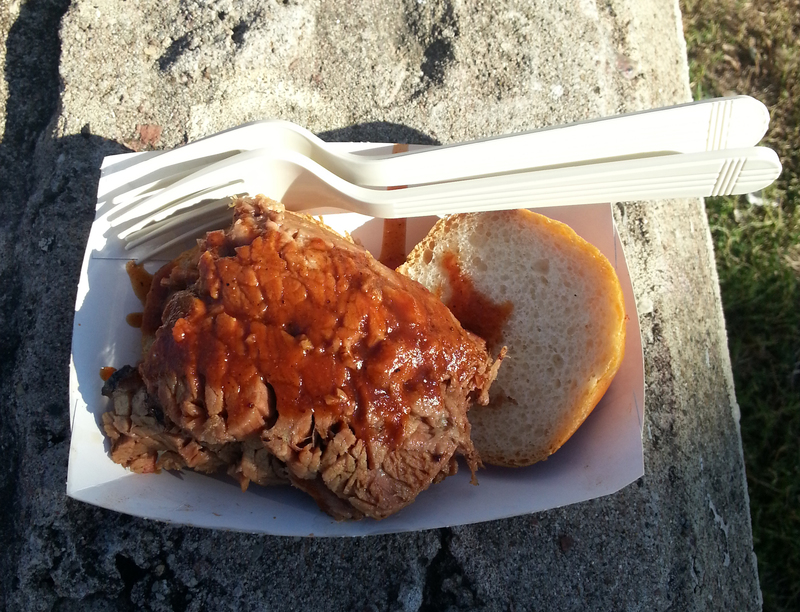 Mighty Quinn’s BBQ Lil Brisket ($5). The outer edges of the brisket had a good smokiness to it, but the majority of the meat did not have this flavour. For me, it was slightly dry, but the worcestershire-type sauce was delicious – slightly sweet and tangy. Just a piece of advice: the Lil brisket is so much more worth it than the big brisket, which had a similar amount of brisket in just a larger bun for $10. Quick stop Korean food. There’s a buffet priced by weight with a hot and cold section, and already boxed dishes behind heated cabinets. We tried the kimchi fried rice, which did not have much kimchi but was nicely spiced. We also had fishballs with rice cakes. 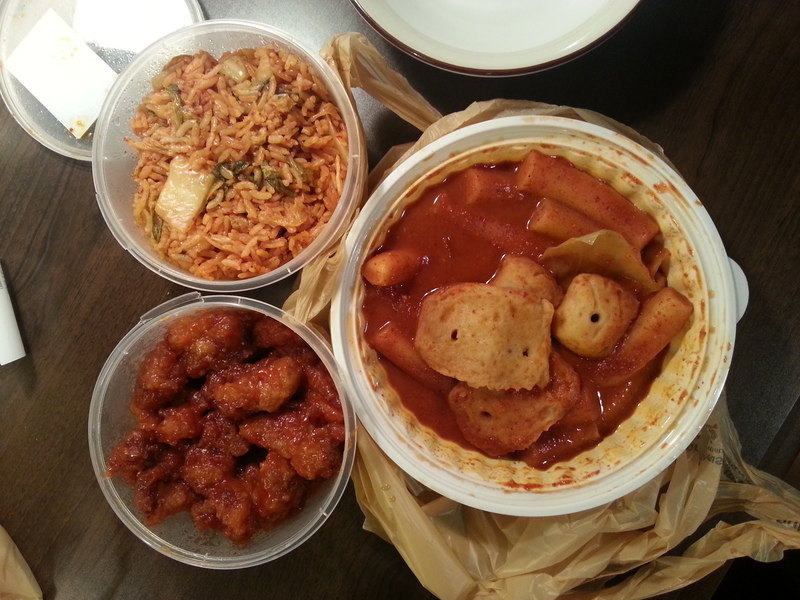 This was very filling – too many rice cakes for my liking, but the sweet spicy sauce was delicious. We also had the spicy chicken, which was lightly battered and not too hot. These 3 dishes was plenty for 2 people at ~$14.